The EZwindow™ video combiner converts analog or digital video from up to 5 inputs into a common, synchronized output, using one of a variety video combining or blending methods. EZwindow™ is designed for minimal latency while providing broad area-of-interest control on inputs and outputs. In addition, EZwindow™ supports video overlays for specialty simulation applications. The EZwindowHR™ video combiner provides a variety video combining or blending functions for one high resolution (up to 2560×1600 @ 60 Hz) input channel, and from 1 to 5 standard resolution (up to1920x1200 @ 60 Hz) input channels. In this example, an EZwindow-2 is used to key a live video feed (in the foreground) over the map graphic (in the background). Using HSV keying, the greenish area (as well as the black, non-active area) becomes transparent, thereby passing the background. In this example, an EZwindow-4 is used to combine 3 different video feeds into the background layer. A 4th input is mapped to the foreground layer, where luma keying is used to overlay the text over the combined imagery. In this example, an EZwindow-3 a) maps Input #2 to the background layer as a lower priority, b) uses a synthesized channel to alpha blend Inputs 2 and 3 in a specific area-of-interest within the background layer as a higher priority, and c) overlays Input 1 via a luma key atop the background layer. 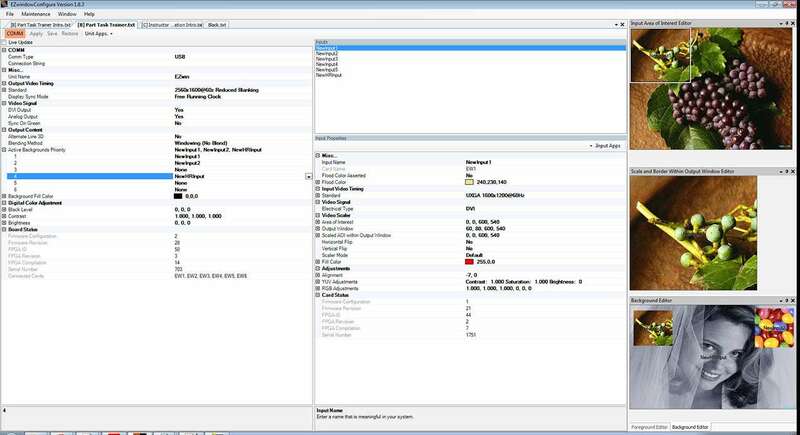 In this example, an EZwindow-4 uses a special high resolution output mode, allowing (4) 1280×800 windows to be combined onto a 2560×1600 Dual DVI monitor. In this example, an EZwindow-4 is used to capture 4 1024×2400 slices of a 4K projector to combine and downsize these feeds to display on a standard 1920×1200 monitor. This is useful while generating content for the 4K projector, as well as for Instructor viewing of the 4K projector feed. The EZwindow-2 is used to combine 4 a left image and a right image in an alternating line 3D image, appropriate for monitors using alternating line 3D optical films and passive 3D glasses. In this example, an EZwindowHR-4 is used to combine 4 different video feeds into the background layer. The HR input is a 2560×1600 video stream mapped to the foreground layer, where luma keying is used to overlay the symbology over the combined imagery.